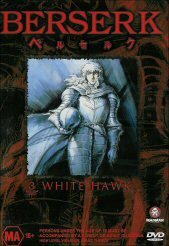 White Hawk is the third installment of Berserk. In number two, Guts was on his way to kill the royal conspirator, when he arrives he finds him sparring with his son. Later when the child accidentally witnesses the assassination of his father, Guts is forced to kill the child to stop him identifying his father's killer. A chase ensues and a guilt ridden Guts is lucky enough to make his break from the guards and escapes into a sewer scott free. While unconscious he dreams some freaky stuff that lets you into his past and why he�s so angry. When coming back to see Griffith to tell him the job is done, he hears him speaking to the princess. Griffith brags about his dream to be a king but as to Guts� dismay Griffith doesn�t consider him his friend in any way shape or form only caring for himself. Griffith later encounters the man in the court that put the idea of assassinating him, playing the fool Griffith sniffs him out and is aware he is the one behind it. The battle that Griffiths� ascension requires rests upon Guts� and Kuska (the love interest), who have fallen over a cliff during battle. Griffith is advised by midland generals not to pursue his comrades, the victory is worth more. Being tracked by the enemy we find all about Kuskas� past and how she became second in charge of the Hawks, while the story and recovering is going on the enemy has caught up with them. The battle begins and as Guts fights you find that he prefers to protect the young women rather than fight to his complete capacity, freeing a path for Kuska to escape as she is heavily wounded, Guts has to kill the second largest man that fights for the opposition, the huge man towering well over the any other man. Guts destroys this man with great difficulty. The commander promises a huge reward for the death of Guts�. Leaving the third DVD at that it leaves you hanging out for the next DVD, when Guts� unleashes his true nature and uncontrollable temper. Again the outtakes left me laughing uncontrollably. DVD quality is exceptional in number three as there�s not so much action as there is story building than the others and you can see the artists have taken a bit more time producing higher quality drawings and more time on the particulars of the sounds. I give Berserk number three 10/10, as this is where the story line is all starting to come together and the characters are taking true form not always on the giving but now on the receiving side of the violence they start to show who they truly care about. I can�t wait for number four it should be another good addition to the series.